parasitology, the study of parasites; bacteriology, the study of bacteria; and mycology, which focuses on fungi. Because microbiology deals with organisms that are comprised of a single cell, a small cluster of cells or a cell particle, microscopes are microbiologists’ most important tools. Generally, microbiologists study organisms by applying stains and dyes, then utilizing a light microscope to observe them. Simple stains, based on molecules with a positive charge, enable microbiologists to detect the shapes of bacteria and how bacterial cells are arranged. Differential stains are made up of multiple dyes and allow scientists to differentiate between different organisms or between structures within an organism. Medical microbiology focuses on bacteria, parasites and other microorganisms that can cause illness in humans. Microbial pathogenesis—the development of a disease and the chain that leads to disease—and epidemiology—how a disease spreads and how it can be controlled—are particularly dependent on a thorough understanding of microbiology. Clinical microbiology emphasizes investigation, diagnosis and treatment of patients suffering from infectious diseases. Many microbiologists choose careers in public health, focusing on disease prevention, epidemiology and infection control. Microbiologists may also work in diagnostic laboratories, where bodily fluids and tissues are tested to detect the presence of microbes in order to diagnose disease or monitor outbreaks or epidemics. 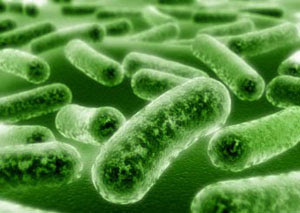 Microbiology has strong applications in the pharmaceutical field. Microbes are essential for production of antibiotics and vaccines that fight illness. Millions of beneficial bacteria populate the human gut and enable people to absorb nutrients from food, as well as keeping dangerous microbes in check. Scientists are also investigating the possibility using microorganisms to infiltrate cancers and deliver therapeutic proteins. A wide range of foods depend on microbes during the production process, and many microbiologists are involved in optimizing microbe-dependent fermentation to maximize flavor while ensuring food safety. Wine, cheese, sauerkraut, coffee, chocolate and cured meats are all prepared with the help of microbes and the microbiologists that understand them. Microbiology is a really important part of science. It's crazy how many different things I can use my ultrasound machine for. We just got one for the home so I'm messing around with it. Microbiology at it's finest!